Jesse James/Younger Brothers lecture: John Koblas - Mr. Koblas is President of the United States Jesse James Club and will be on site for a book signing. He is author of numerous books on Jesse James, such as The Jesse James Northfield Raid, Faithful Unto Death and Jesse James Ate Here. Narration: Les Johnson - Les is on hand to narrate the failed Northfield Bank robbery and the Younger Brother Capture near Madelia. by Lonesome Ron, King of the Valley Yodelers. Entertainment - Townsfolk portrayed by members of the Younger Brothers Capture Committee of Madelia. 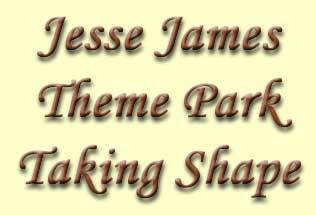 Tours - Guests are welcome to tours of the Jesse James Theme Park throughout the day. Refreshment Stand - Food will be sold all day at the refreshment stand. 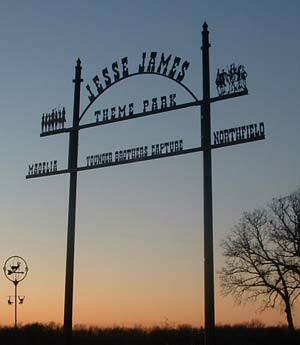 The Jesse James Theme Park is the first ever of its kind in the nation. 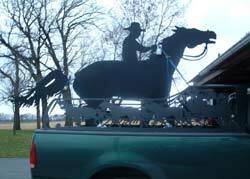 It is hand crafted by Arnie Lillo with life size individual metal cut outs of the many 1870’s horses and characters, and tells the story of what happened to Jesse and Frank James and the Younger brothers gang in this area of Minnesota in Sept 1876. 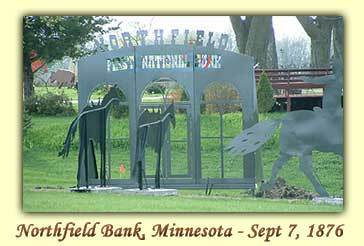 From riding into Northfield, to robbing the bank, to leaving town, killing of Charlie Pitts and the capture of the Younger brothers, the full story is told precisely as Minnesota history knows it to be. But uniquely illustrated in life size metal artwork. 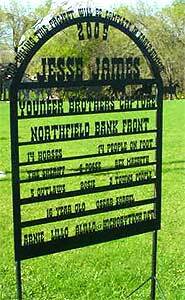 The Jesse James Gang was credited with over 25 bank robberies during the years of 1866 and 1881. Although, it was hard for the gang to openly admit to being involved in any activity that might result in their legal detainment, history has been able to piece together over $270,000 in robberies from Missouri to Minnesota, Alabama to West Virginia, Kentucky to Mississippi. From the passengers' point of view, you may not have returned with your possessions, but at least you had a story to tell that you were robbed by the best - the James - Younger Gang. 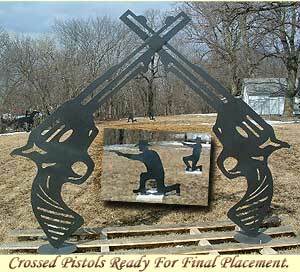 The Jesse James Theme Park features metal art of the James-Younger outlaw activities when they tried to rob the Northfield, Minnesota bank in 1876. Included is the robbery and the subsequent capture of the Younger Brothers in the Hanska slough near Madelia. 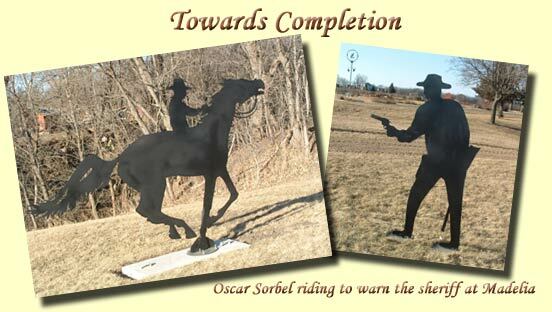 The Oscar Sorbel structure being prepared for the upcoming Jesse James Theme Park. Oscar Sorbel was the seventeen year old who lived outside Madelia and recognized two of the outlaws when they stopped by his father's farm. As soon as he was able he rode to town to alert the Sheriff. The completed "Oscar Sorbel" all loaded up for a road trip through the beautiful river valleys of Southern Minnesota. 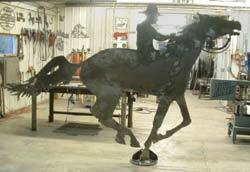 This sculpture is one of the many that will be appearing at the Jesse James Theme Park in Summer of 2005. Please visit again as the work progresses. 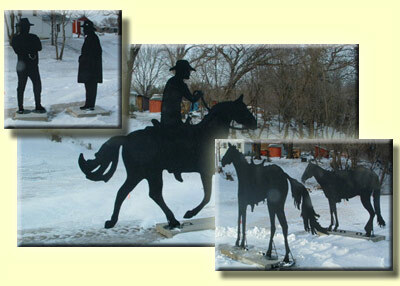 "When completed, by Summer 2005, the park will have approximately 14 life size horsemen representing the Jesse James Gang entering the town of Northfield Mn., next I plan on having the bank robbery with a couple of towns people walking by the bank front, following that will be the outlaws galloping away, next will be the Sorbel boy riding on a full gallop to tell the sheriff in Madelia some 8 miles away. 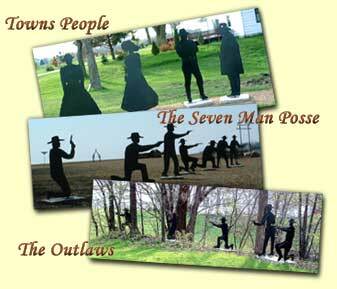 "The next scene will be the magnificent seven (life size) having a shootout with the Younger Brothers in the woods." Take Highway 22 South to right on Co Rd 90 West. Go 3 miles to left on Co Rd 16 South. Go 3 miles to right on 177th Street West (which is the first gravel road past Co Rd 35). ½ mile on your right. Questions? Contact Arnie Lillo at alillo@hickorytech.net or 507.278.3671.